988 is the only Chinese radio station that I listened to in Malaysia. The reason I chose 988 over MY FM or Ai FM, the other 2 Chinese commercial radio station in Malaysia because 988 has more Cantonese speaking DJs and show than the other 2 radio stations and yes I speaks Cantonese at home and I am a Cantonese, so that’s why. 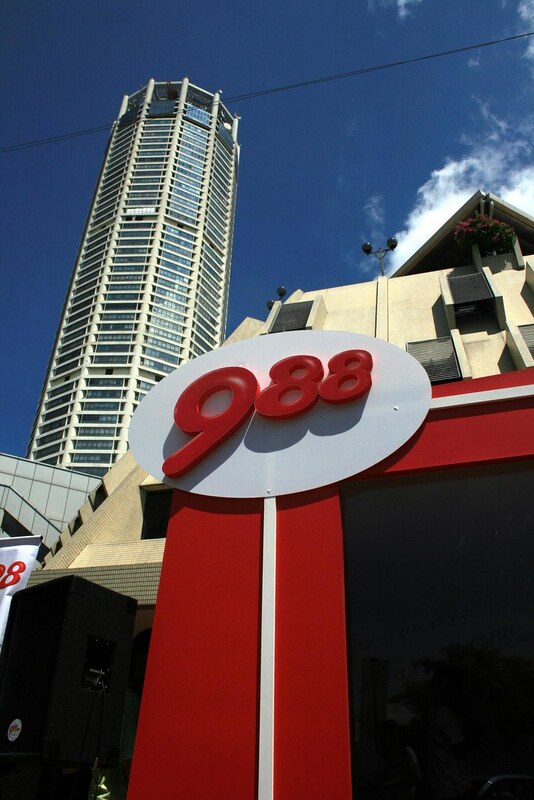 Last weekend, 988 and RED FM, different language radio station from the same company came to Penang to set up a temporarily studio at KOMTAR to run a outdoor live broadcasting. I went to check it out on the Saturday, Penang beloved Chief Minister Honourable Lim Guan Eng was there too to have an interview. It’s a interview on what the new Penang government had done after 100 days of rulling after the general election which happened 3 months ago. Since I was free on that days, so I went there after having my lunch. The live broadcast start early in the morning at 7am and I was there at 1230pm, the interview starts at 1pm. It was a little box right across Prangin Mall and the pedestrian walkway of KOMTAR, I was like standing outside the red box under the scorching heat of the sun with others. If you listens to the 988, you will know the DJ Jeff, Dai Bo, Ah Son and Qiu Yue from the Halo Joe Shen show. They were there hosting the special show on weekend which is actually normally on the weekdays. Peoples were signing their names to receive a feedback and comment form which was to comment on the new Penang government and there’s a field on the form which you could ask any question to the CM. Also, there were these smily and saddy faces were given to the first 50 people who signs their names. It was use to show what do you think about a particular thing that the Penang government had done in the 100 days that you agree with it, support it, like it, or not, etc. 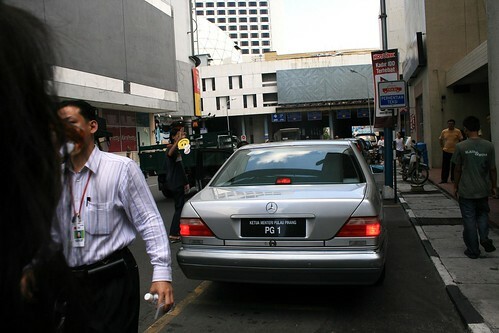 the abolished of New Economic Policy in Penang, the RM100s for poor family and others. Of course, it was smily all the time for me. There were like so many press and videographers in the little box, I guess it’s hot inside even there’s 2 air con, though we who were outside the box were hotter man, the cloud comes and goes, sometime hot, sometime not. Damn, it’s so uncomfortable. Surprisingly, I saw Hong Kong’s press and media were there too. At first I thought it was someone that bought a 2nd hand camera from Hong Kong TVB and later it was true that the crew were from Hong Kong as the DJ introduced about them. If you listened to the radio last weekend, you would actually heard my voice over the air as I did ask a question to CM about the public transportation in Penang. =D I did not said my name though, I just said that I am a student from Chung Ling. So how many points did Penang vote for CM Lim? It’s 77.23. If I was not mistaken, I’ve written 65/100 for him. After 2 hours of interviewing session and standing under the hot sun, finally I can get my feet off the ground to somewhere else. When the CM came out of the BOX, everyone were like following him, asking for autograph and taking photograph with him. Since everyone was doing it, why not me? Yo! 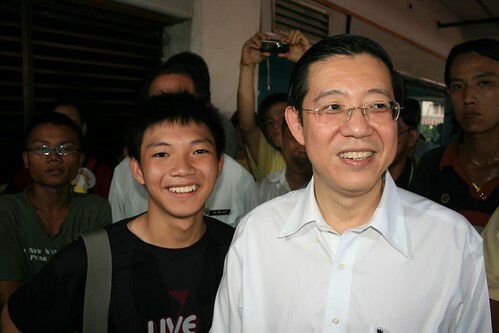 He is the Penang celebrity CM just that I don’t know he can sing or not. It’s his Penang, his first time, so let’s give him a chance. I know nothing about politics. Hehe. Yes. 988 is my favourite radio station too. Yes. I am Cantonese as well. I listen to the interview too. I watch their outdoor broadcasting too when they put it outside Sg. Wang shopping complex in KL. u din ask cm to sign on ur shirt! wat a waste! They just simply rocks. =D Then you might heard my voice on air. Haha. I was wearing black and it is NIKE, I wouldn’t want him to sign my Nike shirt, if it’s some cheapo shirt, yeah! Haha, come down Penang now.